Today’s ruling on Obamacare is a win for us all. The argument around Obamacare is not whether we needed universal health care. Too many uninsured were riding on the MRIs of the insured, which is not a conservative or liberal system, just a stupid one. I’m not alone in saying health care is a conservative infrastructure issue; healthier workers mean higher productivity. It’s also a liberal justice issue; healthier kids do better in school and better in life, a benefit that shouldn’t just be for the non-poor. Unfortunately, the fact that we all agree on universal health care got bent into a shape no one would recognize. When our blood pressure finally drops around this issue, maybe we’ll also see that good things come from a healthy country. And one of the best things might be creativity. We like chunky glasses frames, the ones where the wearer sends the clearest signal possible that they need eye correction. The Buddy Holly is cute on little boys, geeky-chic on high school girls and hip on, well, hipsters. 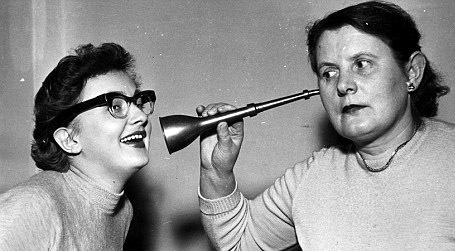 So what’s with the strange aversion to anything that signals bad hearing? Around 36 million Americans have some sort of hearing loss. But I had an uncle with a thunderous laugh simply because he would not wear a hearing aid. Loud and clear to him and many others, a hearing aid transmitted a certain oldness that somehow laughing-for-two didn’t. We need to get over it.